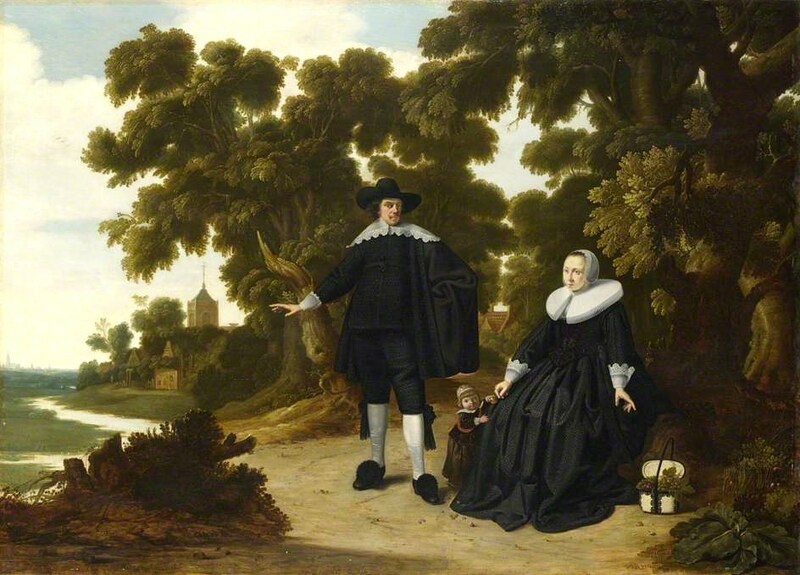 17C Portraits - Families Head Outside as Man Becomes "the Interpreter of Nature"
The Renaissance, from the 14-17C, marked a turning point in portraiture. Renaissance artists began to paint secular scenes, breaking away from the dominant religious art of medieval painters. Partly out of interest in the natural world & partly out of nostalgia for classical Greece & Rome, portraits became valued as symbolic & allegorical objects & as depictions of earthly success & status. The period in Europe was the cultural bridge between the Middle Ages & modern history. The relationship between man & nature was evolving as Francis Bacon (1561-1626) promoted man as "the minister & interpreter of nature." Portraits began to depict the wealthy & the middle class in natural landscapes & in more formal garden settings, where man was obviously controlling the nature around him. As time passed, the Renaissance garden became as much as symbol of the owner's wealth & culture as his house, his clothes, or his art collection. 1634 Cornelis de Vos (Flemish painter, c 1584-1651) Portrait of the Artist's Family portrayed in an outdoors dark & nearly hidden. 1630s Cornelis de Vos (Flemish painter, c 1584-1651) Family Portrait Seated on a Garden Terrace. Cornelis De Vos was most successful as a painter of individual & group portraits. After the departure of Antony van Dyck (1599-1641) for England in 1621, & Peter Paul Rubens' (1577-1640) absences from Antwerp on diplomatic & artistic missions, de Vos became the leading portraitist of the Antwerp haute-bourgeois & patrician society. He only commenced painting full-length portraits after Anthony van Dyck's return to Antwerp in 1627. In these portraits the figures are typically placed in front of architecture & an open landscape or garden. In this portrait, the architecture is missing. The Renaissance, from the 14-17C, marked a turning point in portraiture. Renaissance artists began to paint secular scenes, breaking away from the dominant religious art of medieval painters. Partly out of interest in the natural world & partly out of nostalgia for classical Greece & Rome, portraits became valued as symbolic & allegorical objects & as depictions of earthly success & status. The period in Europe was the cultural bridge between the Middle Ages & modern history. The relationship between man & nature was evolving as Francis Bacon (1561-1626) promoted man as "the minister & interpreter of nature." Portraits began to depict the wealthy & the middle class in natural landscapes & in more formal garden settings, where man was obviously controlling the nature around him. 1627 Family portrait by Cornelis de Vos (Flemish painter, c 1584-1651) Nature boldly intrudes into this portrait. 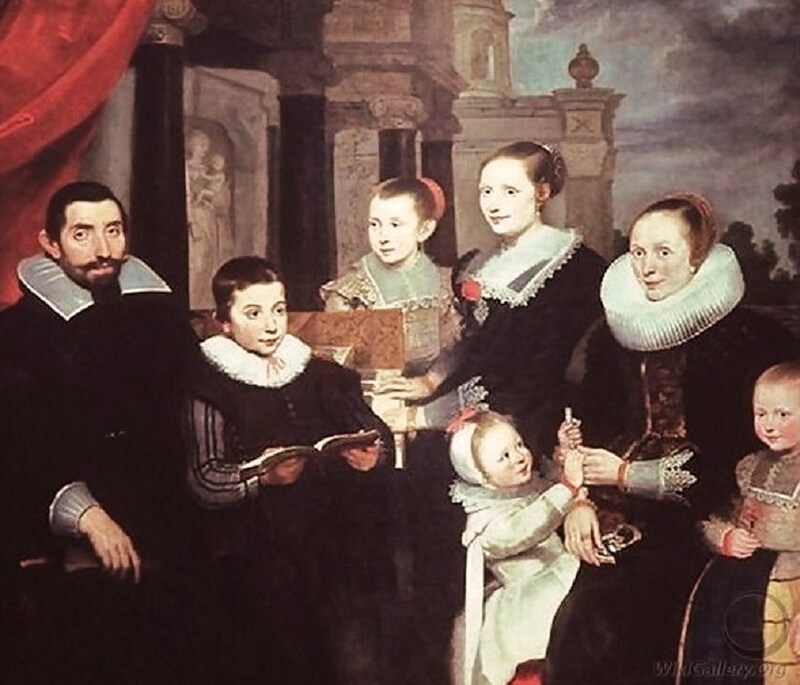 1630s Cornelis de Vos (Flemish painter, c 1584-1651) Family Portrait Seated on a Garden Terrace. Cornelis De Vos was most successful as a painter of individual & group portraits. 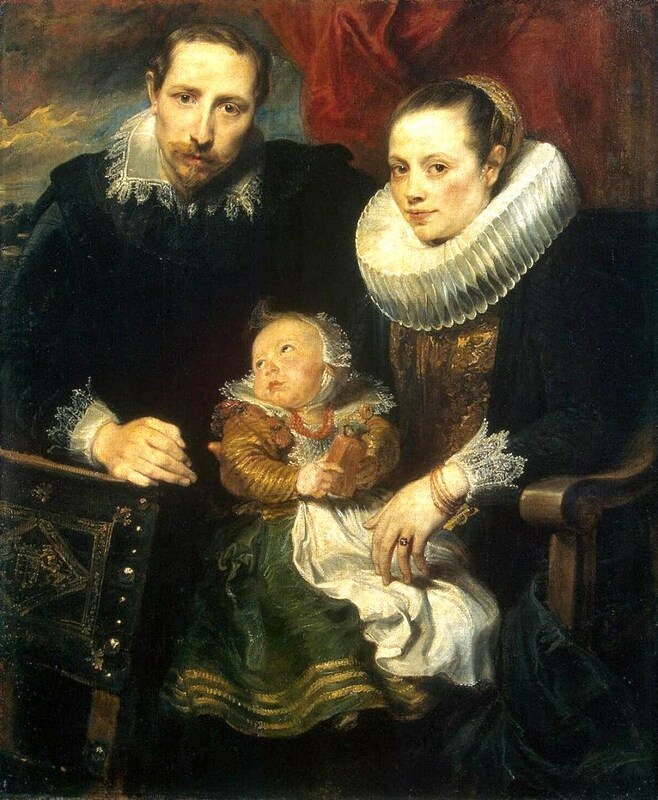 After the departure of Antony van Dyck (1599-1641) for England in 1621, & Peter Paul Rubens' (1577-1640) absences from Antwerp on diplomatic & artistic missions, de Vos became the leading portraitist of the Antwerp haute-bourgeois & patrician society. He only commenced painting full-length portraits after Anthony van Dyck's return to Antwerp in 1627. In these portraits the figures are typically placed in front of architecture & an open landscape or garden. 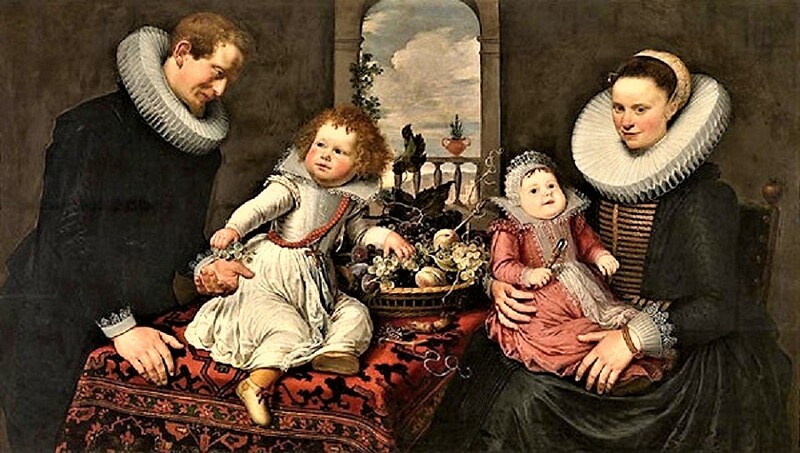 1630s Cornelis de Vos (Flemish painter, c 1584-1651) Family Portrait Seated on a Garden Terrace. Cornelis De Vos was most successful as a painter of individual & group portraits. 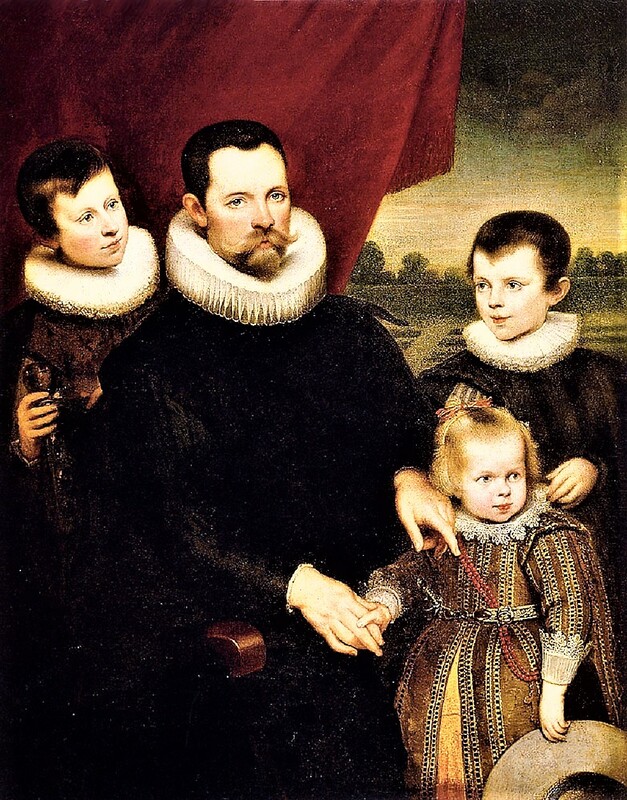 After the departure of Antony van Dyck (1599-1641) for England in 1621, & Peter Paul Rubens' (1577-1640) absences from Antwerp on diplomatic & artistic missions, de Vos became the leading portraitist of the Antwerp haute-bourgeois & patrician society. He only commenced painting full-length portraits after Anthony van Dyck's return to Antwerp in 1627. In these portraits the figures are typically placed in front of architecture & an open landscape or garden. 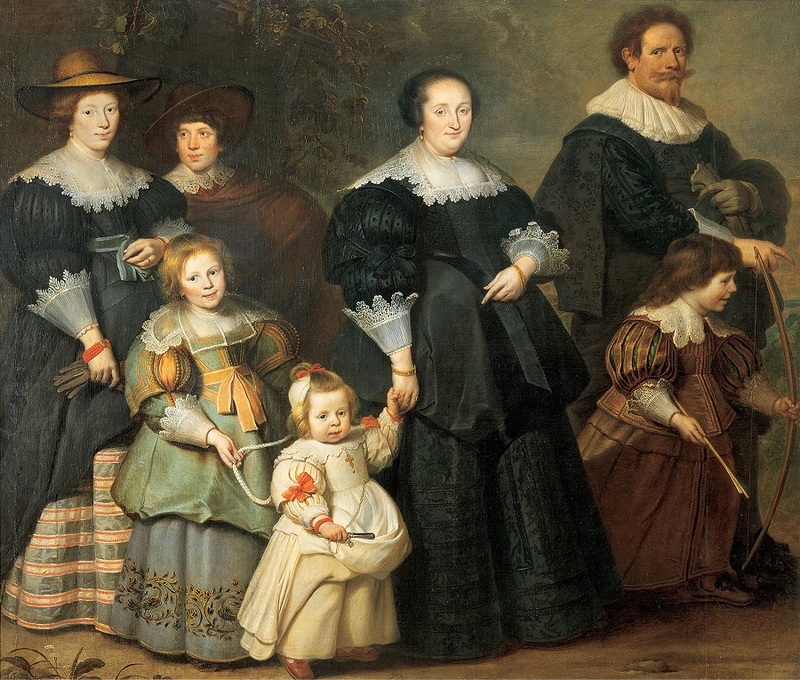 1630s Cornelis de Vos (Flemish painter, c 1584-1651) Family Portrait Seated on a Garden Terrace. Cornelis De Vos was most successful as a painter of individual & group portraits. After the departure of Antony van Dyck (1599-1641) for England in 1621, & Peter Paul Rubens' (1577-1640) absences from Antwerp on diplomatic & artistic missions, de Vos became the leading portraitist of the Antwerp haute-bourgeois & patrician society. He only commenced painting full-length portraits after Anthony van Dyck's return to Antwerp in 1627. In these portraits the figures are typically placed in front of architecture & an open landscape or formal garden. 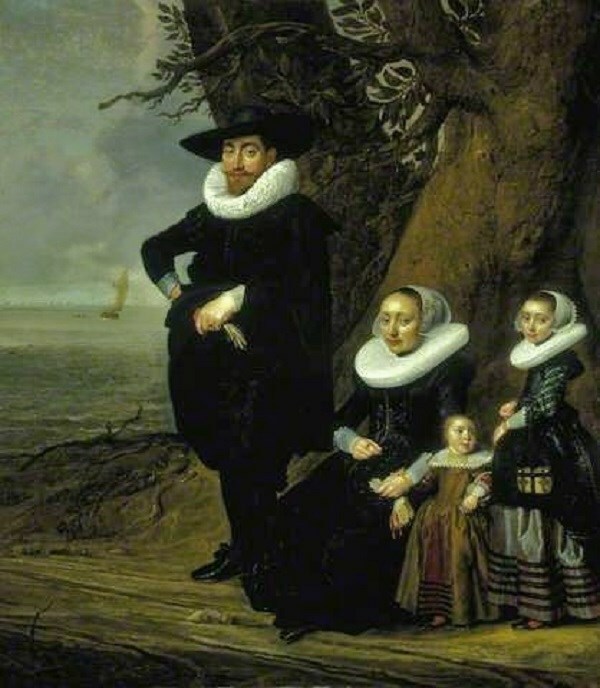 1630s G Donck (Flemish artist, fl 1627-1630) A Family Group (perhaps Jan van Hensbeeck and his Wife, Maria Koeck, and a Child. The National Gallery in Britain tells us that the evidence for the traditional identification of the sitters is unknown. The lady, who wears a figured black silk gown, white muslin cuffs edged with lace, and a huge frilled muslin collar, sits under the shade of a tree. By her side stands her husband clad in a black doublet and mantle, black breeches and white silk stockings, a large lace collar, and a black hat. Between them is their infant clild. In the background is a winding river with a church and other buildings beyond. The man's gesture may refer to the ownership of the estate shown in the background. The basket of grapes on the ground beside the wife may be a biblical reference to the woman's fertility ("Thy wife shall be as a fruitful vine...," Psalm 128:3). 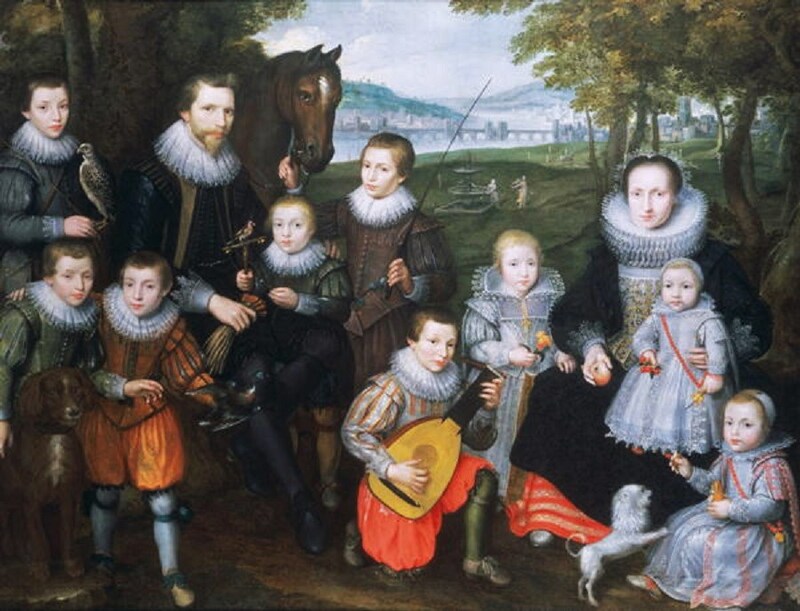 Cornelis de Vos (Flemish painter, c 1584-1651) Nobleman and 3 Children with formal garden beds in the background. 1630s Cornelis de Vos (Flemish painter, c 1584-1651) Family Portrait Seated on a Garden Terrace. Cornelis De Vos was most successful as a painter of individual & group portraits. 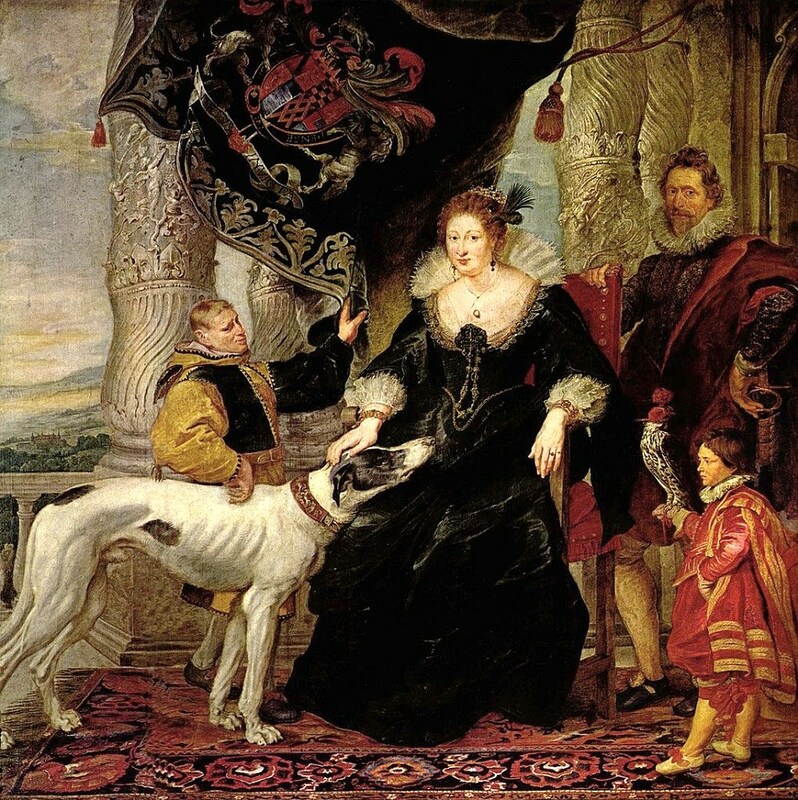 After the departure of Antony van Dyck (1599-1641) for England in 1621, & Peter Paul Rubens' (1577-1640) absences from Antwerp on diplomatic & artistic missions, de Vos became the leading portraitist of the Antwerp haute-bourgeois & patrician society. 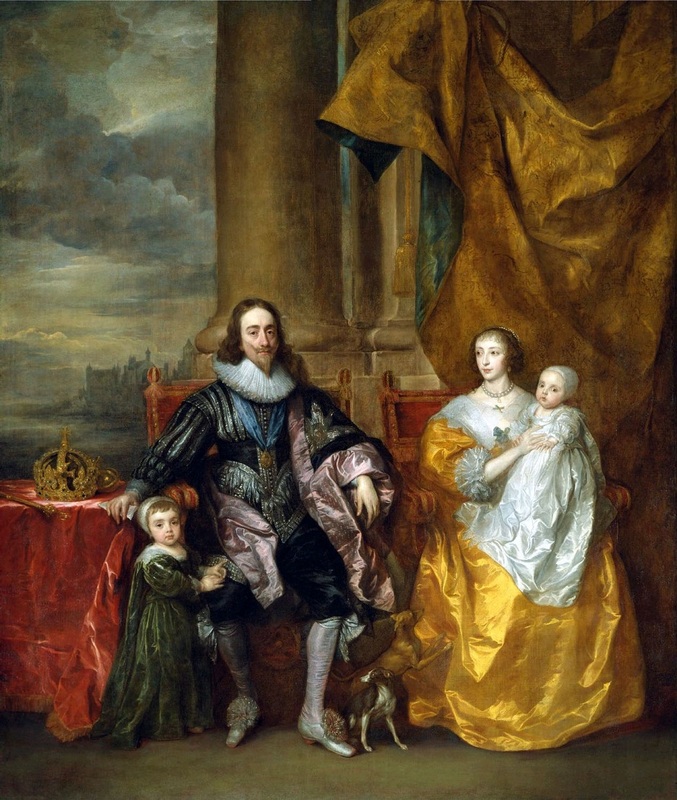 He only commenced painting full-length portraits after Anthony van Dyck's return to Antwerp in 1627. In these portraits the figures are typically placed in front of architecture & an open landscape or garden. 1630 Cornelis de Vos (Flemish painter, c 1584-1651) Family Group in Landscape with a garden fountain in the background. 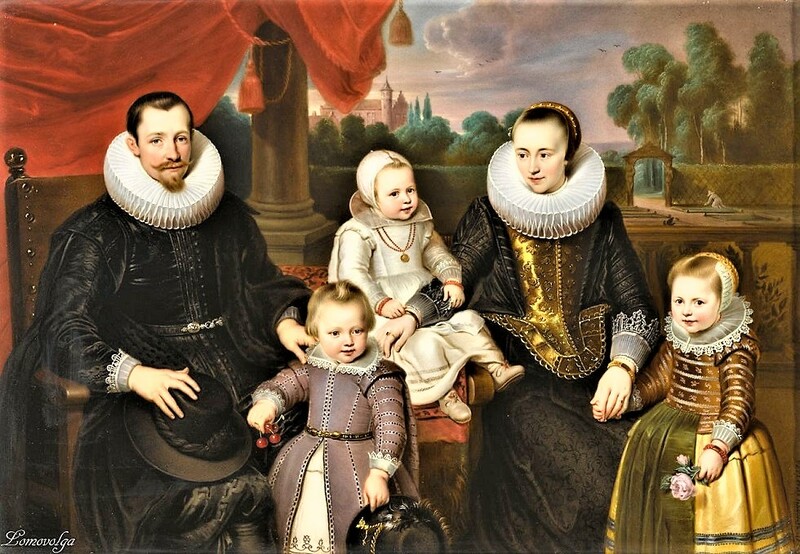 1630s Cornelis de Vos (Flemish painter, c 1584-1651) Family Portrait Seated on a Garden Terrace. 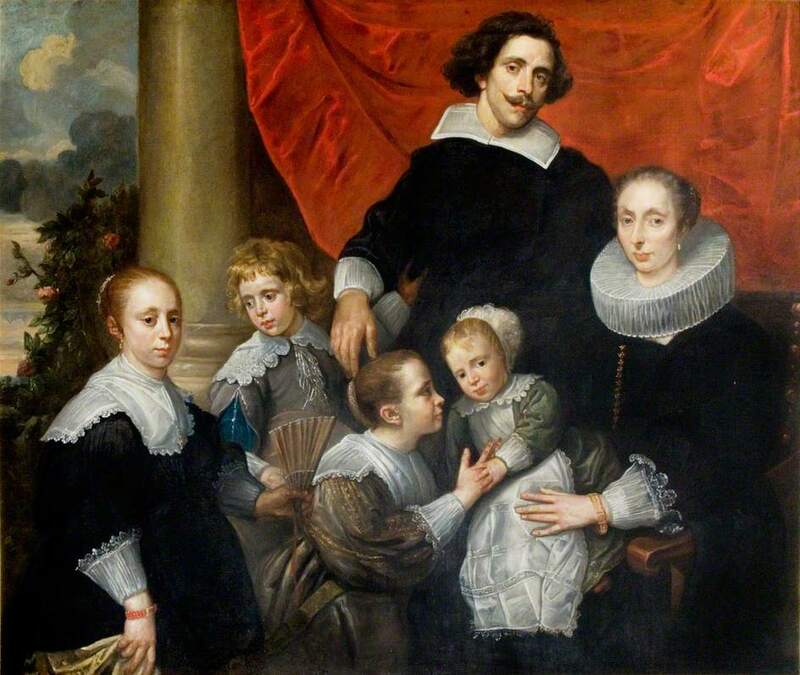 Cornelis De Vos was most successful as a painter of individual & group portraits. After the departure of Antony van Dyck (1599-1641) for England in 1621, & Peter Paul Rubens' (1577-1640) absences from Antwerp on diplomatic & artistic missions, de Vos became the leading portraitist of the Antwerp haute-bourgeois & patrician society. He only commenced painting full-length portraits after Anthony van Dyck's return to Antwerp in 1627. In these portraits the figures are typically placed in front of architecture & an open landscape or garden. 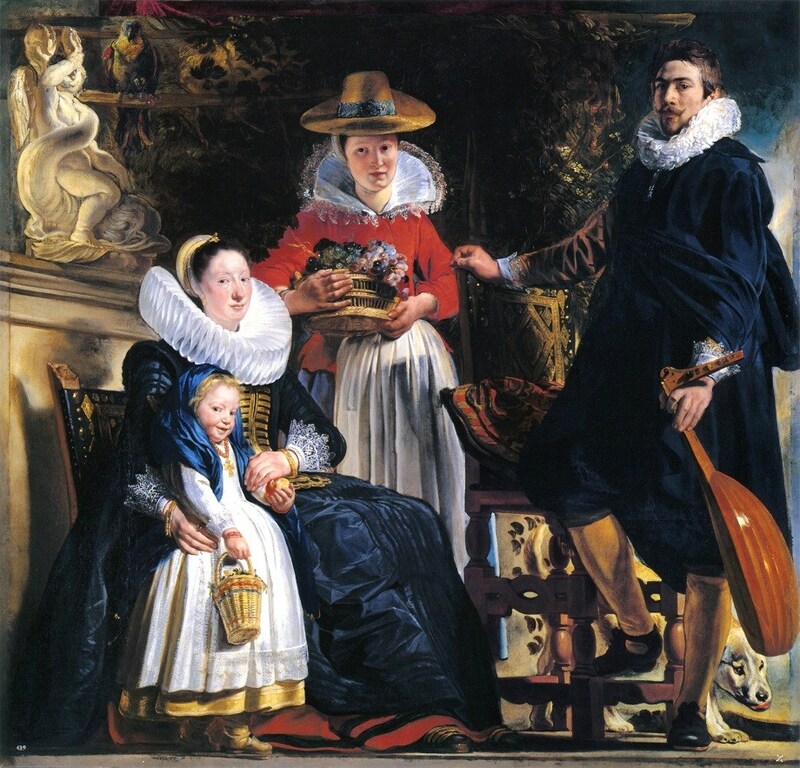 1622 Jacob Jordaens (1593-1678) Perhaps a Self Portrait with his family probably on garden terrace. Still very safe & only nearly in nature. 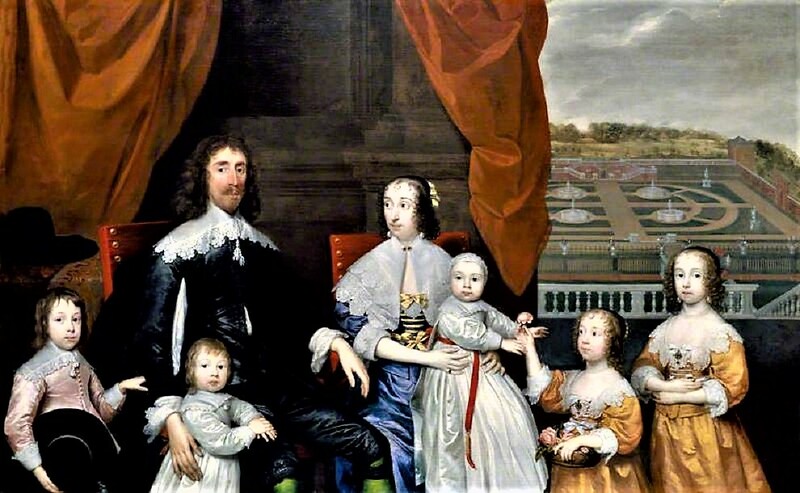 1625 Cornelius Johnson (1593-1661) Portrait of Sir Thomas Lucy and his Family at Charlecote Park, Warwickshire. England. The 1st Sir Thomas Lucy is said to have planted the great double avenue of limes which still stretches away from the house to the south west. The rough split-oak palings that surround the parkland are of a type thought to have first been put up in Elizabethan times. In the 1670s a formal water garden was established, comprising geometric parterres & two ponds in which to breed carp. The garden was lovingly completed by Colonel George Lucy between 1695 & 1700. How long the garden was maintained in this immaculate state is unclear, but by the middle of the 18C it would have seemed terribly old-fashioned. Once the unfashionable water garden had been filled in, Brown created a raised lawn & planted it with the cedars of Lebanon. The Renaissance, from the 14-17C, marked a turning point in portraiture. Renaissance artists began to paint secular scenes, breaking away from the dominant religious art of medieval painters. Partly out of interest in the natural world & partly out of nostalgia for classical Greece & Rome, portraits became valued as symbolic & allegorical objects & as depictions of earthly success & status. The period in Europe was the cultural bridge between the Middle Ages & modern history. The relationship between man & nature was evolving as Francis Bacon (1561-1626) promoted man as "the minister & interpreter of nature." Portraits began to depict the wealthy & the middle class in natural landscapes & in more formal garden settings, where man was obviously controlling the nature around him. Thus, the Renaissance garden became as much as symbol of the owner's wealth & culture as his house or art collection. 1745 copy of 1625 original by Cornelis Janssens van Ceulen (British artist, 1593-1661) The Capel Family pose safely on a draped terrace with their complicated garden in the background. Arthur Capel 1st Baron Capel of Hadham,his wife, Elizabeth Morrison and their children, Mary, Henry, Charles, Elizabeth and Arthur. In 1632, Hadham Hall was inherited by Arthur Capel, who made many additions and alterations to the property. These included the building of a Banqueting Hall that fully enclosed the courtyard to form a quadrangle, and an Italian garden. This he embellished with four fountains, classical statues, and a large terrace overlooking the deer park and woods. This painting is a c 1745 copy of a larger 1625 original. It is thought that the this copy was made for one of the daughters in the painting, Bridget. She was married & would have taken this painting with her, when she moved to her husband's house, Croxteth Hall, Liverpool. The "original" still hangs at Charlecote Park in Warwickshire, the ancestral home of the Lucy family. 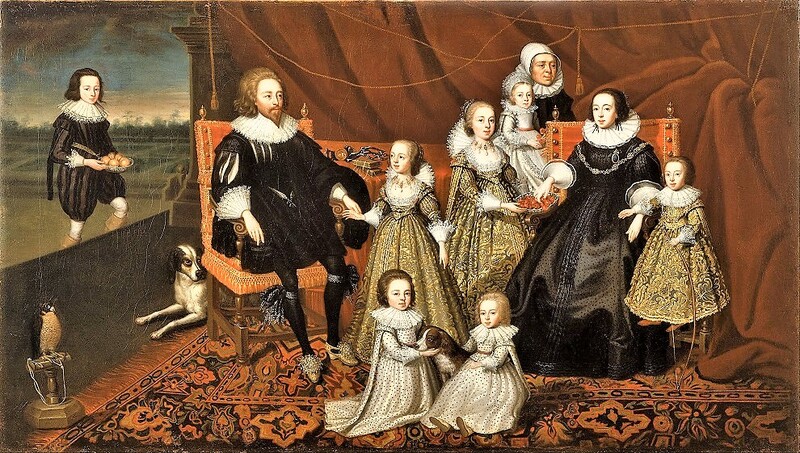 The painting shows Sir Thomas & his wife, Alice, with 7 of their 13 children. The 2 boys at the front of the painting are wearing petticoats. This was usual for the time, when boys were not "breeched;" until they were aged between 4-7. Their their bodices (top of their dress) are like their father's doublet (his short, tight jacket), not like their mother's dress. The baby at the back of the picture is probably a boy whose clothes are made from the same material as the brothers' clothes. The eldest boy on the left, Spencer Lucy, is probably between 10 & 13 years of age. At the time boys of this age were dressed as young adults rather than as children. The faces of the family would have been painted from individual studies. The clothing may have been arranged on a dummy or another stand-in figure. This would have meant that the family, & in particular the children, would not have had to sit for any uncomfortable length of time. The Renaissance, from the 14-17C, marked a turning point in portraiture. Artists began to paint secular scenes, breaking away from the dominant religious art of medieval painters. Partly out of interest in the natural world & partly out of nostalgia for classical Greece & Rome, portraits became valued as symbolic & allegorical objects & as depictions of earthly success & status. The period in Europe was the cultural bridge between the Middle Ages & modern history. The relationship between man & nature was evolving as Francis Bacon (1561-1626) promoted man as "the minister & interpreter of nature." Portraits began to depict the wealthy & the middle class in natural landscapes & in more formal garden settings, where man was obviously controlling the nature around him.